1.Because they recently expanded by taking over the space next door, so you no longer have to sit on a stranger’s lap in order to eat one of their excellent salads. 2. Because many of the menu items are named after artists – Dali, Degas, Chagall – and while you know these artists didn’t create the recipes, (and may not have even been decent cooks themselves), it’s good to remember that these geniuses existed every chance you can get. There’s no doubt that if they could sample the food at Art Café, which has a Middle Eastern slant, they would give it a ringing endorsement. 3. Because a little blue bird adorns their signage and appears in nooks and crannies á la Where’s Waldo all over the restaurant. While sipping your latte, you can imagine this bird and the Twitter bird facing off in a battle of wits, or in a beauty contest, or perhaps hosting a talk show together. 4. Because it’s fun to try and pronounce Malawach (mail-witch? mall-a-wah?) and dipping this fried puff pastry into the spicy red sauce that comes with it increases your chances of getting an abstract red splatter on your shirt. Of course, the risk is well worth it, especially if you order the one with eggplant, hard-boiled eggs, and onions. 5. Because almond croissants are delicious and chocolate-almond croissants are even better. If you precede one of these treats with a Boreka, a savory, feta-filled pastry, you can pretend that you had a well-balanced meal. Of carbs. 6. Because enjoying anything with the intriguing Zaatar, a flavorful mixture of herbs and nuts, could very well result in a sesame seed installation in your teeth that even the best pointillists would envy. 7. Because the oatmeal here is truly a work of art: the drizzling of date sauce, the perfect consistency, and the more-than-ample portion convince you to never make it at home again. 8. Because when it gets nice out, that garden area in front is the perfect place to take your butterfly for a cup of Moroccan Mint tea. 9. Because it is family owned and operated. Thank you to the Kramers for creating such a thoughtful neighborhood spot. 10. Because, in addition to expanding the space, they have also expanded their hours. 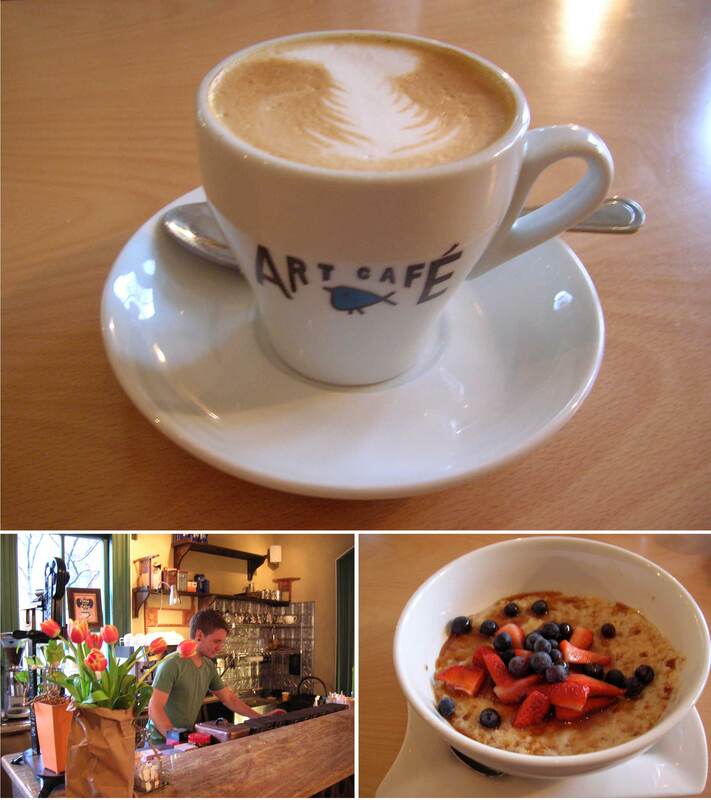 Art Café is now open 7AM-9PM, so there’s more of it to love. Love this place – so happy they have expanded….mmmmm, those chocolate croissants are insane!!!! The sabich is also excellent. They did do an excellent job with the expansion. I did like that little store-gallery that was next door, but it is nice to sit in Art Cafe’s new area now.